A strong advocate of human capital management excellence in Hong Kong, the Human Capital Management Society (HCMS), one of the specialist clubs of the Hong Kong Management Association (HKMA), held a seminar entitled “How Does Entrepreneurship of Talents Make Start-ups Success?” at the HKMA Advanced Management Development Centre on August 24th. The seminar ran in partnership with cpjobs.com, which acted as the media sponsor for the event. The HCMS runs regular seminars on the practical aspects of human capital management. Its latest edition was intended to shed light on Hong Kong’s start-up scene and effective ways of managing human resources in a start-up company. Sporting an eye-catching title and targeting HR experts and would-be entrepreneurs, the seminar drew a packed audience and featured four guest speakers widely regarded as heavyweights in the latest wave of the city’s entrepreneurial spirit. Peter Mok, head of incubation and acceleration programmes at the Hong Kong Science and Technology Parks Corporation (HKSTP), kicked off the 150-minute seminar with a short speech on the city’s apparent complacency with the status quo and growing resistance to change. It has been generally viewed that Hong Kong lags behind its fellow Asian cities in innovation and technology. But the past few years have seen a concerted effort to buck the trend, as evidenced by the emergence of many promising local start-ups, some of which have even hit the headlines. Another guest speaker was Jimmy Tao, CEO of Vitargent, a pioneering start-up in the field of safety testing technology. Tao is jokingly described as a “serial entrepreneur”, as he has founded and run four different companies in as many industries over the past 13 years. “My CV does look a little jumpy,” Tao quipped. 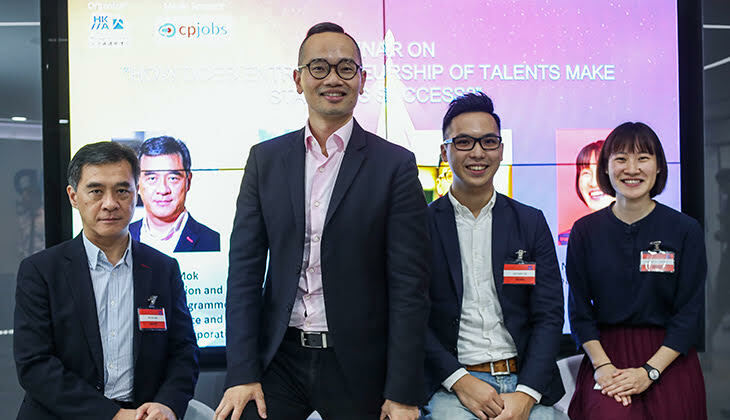 Katherine Cheung, head of marketing (Asia-Pacific) at Snapask, an education technology start-up that offers tutoring services to more than 500,000 students across eight regions in Asia, echoed So’s opinions on staff retention. Can HR information in relation to hiring be shared?